- Our document is a "Certificate of Discharge" from the ship, "Britannic" for British seamen "F. G. Raddish" age "30." The route of this ship is identified as, "North Atlantic," and the dates of "engagement" and "discharge" are "6th February 1895" to "1st March 1895." Captain Edward Smith signs, "E. Smith" next to his title as "Master." The document is countersigned by a representative from the shipping company. At the bottom of the document are two stamps with "VG" in the center. One stamp indicates, "Character of Conduct," and the other, "Character of Ability." Tape residue shows on left serrated edge of the document. Smith began his life on the sea as a teenager when he signed on to the crew of the "Senator Weber" in 1867. He rose up the ranks and qualifications, earning certificates as a second mate in 1871, a first mate in 1873, and a master in 1875. The first vessel he commanded was the "Lizzie Fennell," a 1,000-ton ship that moved goods to and from South America. Smith switched to passenger vessels in 1880 when he went to work for the White Star Line which would own the "Titanic." By 1885, he was the first officer of the "Republic." Stepping on board the "Britannic" for the first time in 1884, he returned as its captain several times mainly between 1891-95, the year he signed our document. His success on the "Britannic" facilitated his securing commands of the newest and most impressive ships of the White Star Line. He became familiar with the transatlantic crossing and known for his easy rapport with the shipping line's elite passengers, thus acquiring his nickname as the "Millionaire's Captain." Smith also served in the British Royal Navy during the Boer War in South Africa (1899-1902). He is now best remembered for his final voyage at the helm of the exclusive and most impressive ship, "RMS. Titanic." Documents signed by Smith rarely become available. 1895. A Story of an Eastern River. New York: Macmillan and Co., 1895. 3 pp undated ads. Original black cloth. First American Edition of Conrad's first book, with a text that varies considerably from the English edition (because it was typeset from uncorrected proofs). We find the American edition to be somewhat scarcer than the English one (as well it should be, since only about half as many were issued: according to Keating "only 650 copies of this edition were printed, and it is a rare book").~This copy is in Cagle's binding "b" (no priority certain), black cloth with a double blind­stamped border rule on the covers and with "The Macmillan Company" at the foot of the spine. It is a near-fine copy, with scarcely any wear and with the endpapers intact (volume slightly aslant, faint variation in the sizing on the boards). Cagle A1b.2, binding b. The Jungle Book AND The Second Jungle Book. New York: Harper & Brothers. Near Fine in Fair dust jacket. 1895. First Edition. Cloth. Original beige cloth, gilt titles and decoration on spine and upper board, t.e.g., sewn in bookmark, in the publisher's printed dust-wrapper; unpaginated, but approx. pp., printed recto only throughout, with head and tail-piece illustrations on almost every page. A touch of rubbing at the corners, light offsetting to the endpapers, else fine and bright; the jacket is in pieces, repaired on the verso with archival tape, with large chunks out, and the bottom inch of the spine missing altogether. Super-scarce in the extremely delicate jacket . [circa 1895-1905]. Commercially produced blank album measuring 10.5" x 12" with associated loose photos. Bound in half-leather and cloth boards, white silk moire endpapers. The entire collection consists of 153 photographs, with 69 tipped-in on the album boards and 84 loose prints. Most are platinum prints (including two cyanotypes) measuring about 7.5" x 4.5", with some dozens or so ranging in size from 1.5" x 4" to 6" x 8". Included are a few variant outdoor shots of the same or similar subject that have been trimmed into odd panoramic sizes. The album is neatly split in thirds at the spine with some scattered soiling to the exposed boards, thus good only, some laid-in images with scattered nicks and short tears at the edges, overall very good.Beautifully composed photographs taken by an unknown photographer, most likely a woman, from the town of Vergennes, Vermont. Images of the town's streets and houses taken at the height of its industrial boom in the late 19th Century, with many interior studies of women reading, outdoor and landscape views of mostly women in the surrounding countryside and creeks, and boating on Lake Champlain. Many other images of women vacationing and sailing off the Maine coast at Gerrish Island and Camden, and at leisure in a New Hampshire wood. Included is one photograph of four women in a wood, one of whom is reaching her left hand behind a large format camera, which suggests that the photographer might be her. An immensely appealing collection of images by this unknown Vermont artist. .
1) Erinnerungen des Herrn Oberst Bernhard Isler von Wohlen i.A., weiland Lieutenant in napoleonischen Diensten. Nach seinen Aufzeichnungen herausgegeben von Dr.Albert Maag. Aarau, Sauerländer & Comp., 1895.. 1.Ausgabe. 81 S. Mit Frontispiz-Porträt und 1 gefaltete Tafel ("En France 1855.2e Legion Etrangere (Suisse). - 1er Regiment Etrangere en Afrique 1856/60"). 21 x 14 cm. Privat-Halblederbd. mit Rückengoldprägung. Vorsätze mit Buntpapierbezug.. 4 Bände in 1 Band. 1.Ausgaben. 2 Bände angebunden + 1 Bd. in Tasche: ---- 2) "Drei Jahre als Unter-Offizier bei der Französischen Armee 1855-1858. Von E.F.(Emil Fischer?) und Irrfahrten eines modernen Reisläufers (Abdruck aus 'Basler Nachrichten')". Basel, Koehler'sche Buchhandlung, 1897. 125 Seiten. ---- 3) "Erinnerungen an eine fünfjährige Dienstzeit in der französischen Fremdenlegion mit besonderer Berücksichtigung der daselbst bestehenden allgemeinen Zustände (Algier und Tonkin 1880-1885)" von Hans Lüthi, gew.Corporal. Bern, Jenni's Buchhandlung (H.Koehler), ohne Jahr. 120 Seiten. ---- 4) "Erinnerungen an Oberst Heinrich Wieland". Hrsg. von Oberst Hans von Mechel. Basel, Benno Schwabe, 1896. 100 Seiten (unaufgeschnitten) mit Frontispiz-Porträt. Orig.-Kart. (leicht) in Orig.-Tasche am hintere Deckblatt /// Ecken bestossen. Rücken berieben mit Farbverlust. Durchgehend gebräunt. Exlibris auf Innenseite am Hinterdeckel. London: John Lane. 1895., 1895. First Edition. Octavo, pp. 290, 30 of adverts. Blue cloth covers with light blue decoration and titles to front, same decoration and gilt titles to spine, edges uncut. 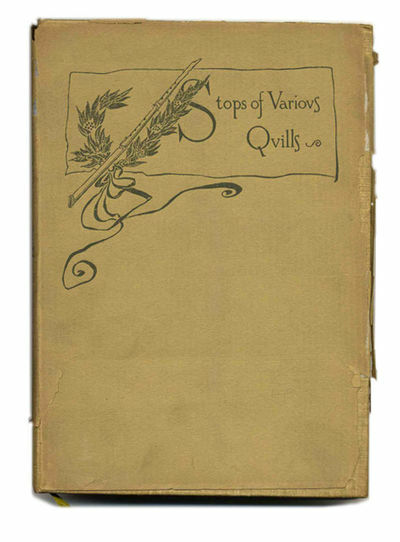 Cover and title page design by Beardsley. Some spotting to prelims, edges of pages are beginning to brown ever so slightly. Quite heavy bumping to the head and tail caps and to the corners, some rubbing to the cloth. - Peter Winter-Heidingsfeld studierte ab 1895 an der Münchner Akademie bei Wilhelm von Rümann. War Mitglied der Münchner Sezession und des Münchner Kunstvereins und beschickte die Ausstellungen im Glaspalast. Bollettino del Club Alpino Italiano. Anni : 1894,1895 - 1896,1897 - 1898,1899,1900,1901,1902,1903,1904 - 1905. Club Alpino Italiano 1895-1905 In 8 12 annate ril.in 9 voll. di pp. 400 cad. Con carte e ill. Ril. coeva m. pergamena angoli tasselli e oro.Tagli picchiettati in rosso. London: William Heinemann 1895, 1st Edition. (Hardcover) viii, 152 (16). Very good. Small Octavo. Original tan cloth with maroon lettering and sphinx illustration on front cover (also small illustrated symbol on back cover). Navy lettering on spine. Light wear and rubbing to boards with some light bumping to top and ends of spine. Light foxing to endpapers. Front free endpaper replaced at an early date. Clean, tight text block with long outer edge untrimmed (and light soiling to the top edge). Previous owners name on top of the half title. 4 in the Wells Society Bibliography. The first issue complete with the ads. "A prophecy of the future decay and eventual extinction of mankind, this is one of the most famous science-fiction stories ever written.[...] the first version of the book appeared in 1888 as the 'Chronic Argonauts' in the Science Schools Journal, a college magazine founded by Wells (reprinted as an appendix to the Early H. G. Wells by Bernard Bergonzi, Manchester University Press, 1961). A revised and expanded version of 'The Chronic Argonauts' was serialised in the National Observer under the title the Time Machine.".. Crane, Stephen. 1871 - 1900]. The TIME Has COME, The WALRUS SAID, To TALK Of MANY THINGS. The Society of the Philistines. Thursday Evening. December Nineteenth, 1895. In Honor of Mr. Stephen Crane. N.p., 1895. 5 stanzas of verse with 7-line note. 2 pp., on two sheets of blank stantionery. 8vo. Fine. 5 stanzas of verse with 7-line note. 2 pp., on two sheets of blank stantionery. 8vo. Author of "Ben Bolt", New Jersey Congressman, and Enemy of Poe. Thomas Dunn English (1819-1902) was a proilific author of poems, ballads, and novels; he also server two terms in the U.S. Congress as a Representative from New Jersey; but his fame as a writer rests on the ballad in wrote in 1843, "Ben Bolt." First published in Nathaniel Parker Willis&#39; magazine, NEW YORK MIRROR, "Ben Bolt" was set to music many times and became very popular, especiallly in the version set to a tune by Nelson Kneass. In his note appended to this transcription of the poem, English writes:&#11;&#11; "The foregoing stanzas are as they originally appeared in Willis & Morris&#39;s NEW YORK NEW MIRROR, in the year 1843. Though they have been set to music eight tiimes, the only popular melody was the one take from a German air, by Kneass. The words there - three stanzas only being taken - are very much mutilated. "&#11;&#11;"It was hugely successful at the time, but had a new lease of life as the song that Trilby O&#39;Ferrall sings in the novel TRILBY (1894) by George du Maurier. It is described in the novel as an &#39;unsophisticated little song,&#39; but when Trilby performs it under the influence of the sinister hypnotist Svengali it reawakens a &#39;cosmic vision of the beauty and sadness of things&#39; in her former lover Little Billee." (Derek B. Scott, THE SINGING BOURGEOIS: SONGS OF THE VICTORIAN DRAWING ROOM AND PARLOUR. Aldershot, Hampshire; Burlington, VT: Ashgate, 2001).&#11;&#11;Ironically, "Ben Bolt" being a tribute to a long-lasting friendship, English is also remembered as the bitter foe of his former friend, Edgar Allan Poe. The two had a falling out which resulted in a fist fight, as well as a long running literary feud. A BIBLIOGRAPHY OF THE JAPANESE EMPIRE: Being a classified List of All Books, Essays and Maps in European Languages Relating to Dai Nihon [Great Japan], published in Europe, America & in the East, from 1894-1906. EXCEPTIONALLY USEFUL AND COPIUS EARLY BIBLIOGRAPHY ON JAPAN London 1895, - Kegan/Tokyo 1907, Maruzen. Black cloth, 2 vols.set, vols. 1 & 2 only, leather labels on front covers, veryclean,bright set,indices, vol.1 a.e.g., small college stamp lower page edge, Pason J. Treat's signed copy. R A R E Color scans available for this book on request. Description content 2015Copyright Rare Oriental Books Co.
Berlin, Verein für Freies Schriftthum, (1895)., 1895.. 359 Seiten., 8°. 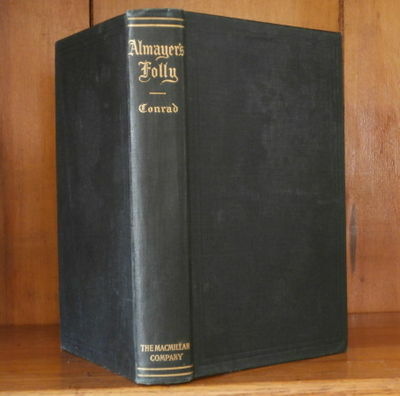 blaue goldgeprägte OLeinwand., Hardcover/Pappeinband Zustand gebraucht, Selten !!!! Einband leicht angeschmutzt, Papier gebräunt, Ecken leicht bestoßen, gut..
25 original parts. San Francisco: William Doxey, 1895-1897. 25 original parts, including Epi-lark, each either folded, stitched, or stapled. With publisher?s indexes to ?Book The First: Nos. 1-12? and ?Book The Second: Nos. 13-24? and publisher?s advertisement for Book The Second. With supplements to No. 1 (portrait of Pico Della Mirandola), No. 2 (portrait of Robert Louis Stevenson), and No. 22 (song sheet, ?Vals de Monterey Viejo?). No. 22 is inscribed ?Florence Paul - Compliments of Gelett Burgess.? Expectable browning and edge wear to all issues. Approx. 8 issues have pink or green stains to outside edge. No. 9 has 0.5? x 1? tear with loss to text block. Three other issues have small tears not affecting text block, first publisher?s index has extensive fold-tears but no loss. Housed in a custom portfolio with slip case. More commonly found bound in 2 vols., rare in original parts as here. A complete run of San Francisco?s original Bohemian ?zine,? written and illustrated by Gelett Burgess and his fellow irreverent aesthetes, ?Les Jeunes,? including Maynard Dixon, Porter Garnett and Ernest Peixotto. The first issue contains Burgess? immortal verse, ?Purple Cow,? and the last, fittingly, his regretful revocation: ?Ah, yes, I wrote the "Purple Cow"?" / I'm Sorry, now, I wrote it; / But I can tell you Anyhow / I'll Kill you if you Quote it!? The Works of Edgar Allan Poe in eight volumes, 8 vols. Geschichte der Familien Mylius, genealogisch-biographische Familienchronik der Mylius aller Zeiten und aller Länder. Mit 3 Wappentafeln und zahlreichen in den Text gedruckten Porträts. George Routledge and Sons, London, 1895., 1895. 76 x 103 mm, with frontispiece, pictorial title, 12 illustrations with inset text, and 4 further illustrations depicting the seasons. A note on postage in the UK. Publisher's cream cloth with illustrations and titles to both boards. Plain cream dust wrapper with brown ink titles. All edges gilt. Fine. Now housed in a brown cloth clamshell case with an acid free felt inner. London George Allen 1895. G: in Good condition without dust jacket. Cover rubbed with some edge wear. Previous owner inscription on half-title. Occasional foxing Reprint Blue hardback cloth cover with peacock design in gilt 180mm x 130mm (7" x 5"). xxvii, 476pp. George Allen, Ruskin House, 156 Charing Cross Road, 1895. Hardcover. Fair/No Dustjacket. 1895. 476 pages. No dust jacket. green, decorative cloth with gilt lettering. Illustrations by Hugh Thompson and preface by George Saintsbury.Hinges cracked exposing netting. Mild foxing throughout. Noticeable tanning and handling marks with scuffing to endpapers and intermittent dog-eared corners. Gilt trim along page edges with light yet noticeable scuffing and fading towards block-edge.Moderate rubbing and scuffing along spine with splits along edges, chipping at ends and mild fraying. More faded along spine than to boards. Noticeable bumping, rubbing and scuffing to spine ends and to corners with noticeable rubbing and wear along edges and over surfaces. Slight denting at top of front board with light scoring at rear. London: George Allen. G: in Good condition without dust jacket. Cover rubbed with some edge wear. Previous owner inscription on half-title. Occasional foxing. 1895. Reprint. Blue hardback cloth cover with peacock design in gilt. 180mm x 130mm (7" x 5"). xxvii, 476pp. .
"The foregoing stanzas are as they originally appeared in Willis & Morris's NEW YORK NEW MIRROR, in the year 1843. Though they have been set to music eight tiimes, the only popular melody was the one take from a German air, by Kneass. The words there - three stanzas only being taken - are very much mutilated." "It was hugely successful at the time, but had a new lease of life as the song that Trilby O'Ferrall sings in the novel TRILBY (1894) by George du Maurier. It is described in the novel as an 'unsophisticated little song,' but when Trilby performs it under the influence of the sinister hypnotist Svengali it reawakens a 'cosmic vision of the beauty and sadness of things' in her former lover Little Billee." (Derek B. Scott, THE SINGING BOURGEOIS: SONGS OF THE VICTORIAN DRAWING ROOM AND PARLOUR. Aldershot, Hampshire; Burlington, VT: Ashgate, 2001). Ironically, "Ben Bolt" being a tribute to a long-lasting friendship, English is also remembered as the bitter foe of his former friend, Edgar Allan Poe. The two had a falling out which resulted in a fist fight, as well as a long running literary feud. London: Kegan, Paul, Trench, Trubner. Very Good in Very Good dust jacket. 1895. Cloth. Maroon cloth boards with titles and elaborate decoration in gilt on upper board and spine, t.e.g., board edges beveled, in the publisher's printed paper dust-wrapper; pp. xiii; 120, plus frontis and 21 b/w plates, and additional headpieces throughout. Corners bumped, offsetting to endpages, chip to the bottom of p. xiii, else clean and bright; the jacket is sunned at the spine, with chips out at the spine tips and corners . Richmond, Virginia 1895 - Two very rare portrait photographs taken by James Conway Farley, now recognized as America's first prominent African-American photographer, taken at his studio in Richmond, Virginia. Both are cabinet cards in fine condition (measuring 3.25" x 5"), with blind stamped borders and the studio name printed in maroon: "Jefferson Art Gallery, 523 Broad Street, Richmond, Va." Each portrait is of the same unidentified young woman wearing a different fashionable dress and hat. She appears to be in her twenties, and possibly of mixed race. Both photographs were likely taken not long after Farley opened his studio, "The Jefferson" in 1895. A historically important, scarce survival. London: J. Shiells & Co.. 1895. First printing. Hardcover. Near Fine. Eight volumes, complete. Small octavos, deluxe binding with extremely bright chestnut brown morocco, raised bands, gilt titles and gilt floral decorations on spines, gilt top edges, marbled endpapers, 24 photogravure plates, about a Near Fine set, minor age-toning or tanning to the pages, a hint of rubbing or wear to the edges of the covers. A very attractive set! London: Whittaker and Co.. Good condition only with very strong signs of staining to the cover. Binding in firm condition. Interior excellent ! Very Rare Historical Publication on Explosives - here the more valuable second Volume !!. Volum II only. London, Whittaker and Co., 1895. 8°. XII, 444 pages. With 181 illustrations. Original Hardcover. Good condition only with very strong signs of staining to the cover. Binding in firm condition. Interior excellent ! Very Rare Historical Publication on Explosives - here the more valuable second Volume !! Including for example the following chapters: Gun - Cotton / Preparation of the Raw Cotton / Extraction of teh Acid / Compressed Gun-Cotton / Pyro-Paper / Schultze Powder / Nitro-Starch / Fulminating Sugar / Properties of Nitro-Glycerin / Physical properties / The Application of Nitro-Glycerin / Explosives from Aromatic Hydro-Carbons etc. / Fulminate of Mercury / Manufacture / Dynamite / Properties of Dynamite / Blasting Gelatine / Gelatine Dynamite / Sprengel's Explosives and Safety Blasting Materials / Smokeless Powders etc. etc./ Caps and Detonators / Marcel Deprez's Manometric Balances / Storage and Carriage of Explosives / Testing Dynamite, Vlasting Gelatine and other Explosives / Bibliography of Explosives / Alphabetical Subject Index. America, 1895. Hardcover. Very Good. Mottled black cloth, "Photographs" gilt-stamped in script on front board; oblong 4to (12 x 10.5 inches); unpaginated, contains 22 heavy cardstock light grey leaves, each with 4 b/w photographs (albumens) mounted to recto and verso ,and labelled by hand -- nearly 100 photographs in all. Boards a bit scuffed; lightly frayed at extremities; leaves bound with rope at spine ends, with rope missing from head of spine. A few photographs a little faded or over-exposed, but all are legible, and some are lovely. A collection of photographs of geological and ornithological interest, taken in the summer of 1895, possibly as a school project, as it also includes a few images of typical college silliness. The overall tone of the colletion is serious and studied, with every location named and dated -- includes Decorah, the Iowa River, the dams at Terill's Mill and Coralville, Dubuque, a steamboat on the Mississippi, and more, recording bridges, banks, buildings, quarries, and streets. The animals encountered along the way also get their due, a flying squirrel, a series of snakes, and a pretty photograph of a dead red-tailed hawk. A baseball game between S. U. I. and Luther College is taken from a distance, which is typical of the interests of our compiler, who is more careful to note "cross lamination in carboniferous sandstone at Wyoming hill" than he is to record the names of his friends, though some of the fun of college does manage to find its way in. A few buddies are named as they drag their boat through the Oneota river (Bartsch, Joe Allen, Fitz), and there are some candid photographs of students "at Overholt's," attending an athletic field day, collecting golf ball sized hail stones after a storm and -- the college classic -- a roommate, cleaning his feet, in an impossibly messy room. Zola, Emile, French writer (1840-1902). Paris, 19 and 20 Nov. 1895.. 4to (203 x 130 mm). 4 pp.. In French. On November 19, Zola writes to his wife: "I see that your day on Saturday was well spent: a visit at the curiosities merchants, lunch with the Luzzattos, a visit in the Coliseum, dinner at the Embassy. And how you pressed yourself to get double the benefit! You speak of leaving Rome Tuesday evening, that is, today. You will thus not have received the letter in which I advised you to stay until the Consistory. You have to return in the end, if you have had enough. Only, I am a bit embarrassed about my letters, as you didn t send me the dispatch I asked you to send three days before you leave Rome. I'll take the chance and continue to write you at the Grand Hotel, from where my letters will no doubt be forwarded to you. Today I did up my first small packages and sent the first two chapters of Rome to the translators. Caponi will have these two chapters in his hands this evening, with the authorization to begin in La Tribuna of December 23. I haven't seen Caponi again; the seven hundred francs are embarrassing to him. I have negotiated everywhere for Rome except with Spain and America. Spain will come, but I doubt very much that America will this time. That will make a hole. All the same, I am counting on the translations bringing in thirty to forty thousand francs, which is a reasonable figure. After my lunch, Jules having told me the masons had finished their work in the old pit, I went down to see. That will make a superb cellar, much bigger than our old wine cellar. It will be cooler than the one we re using now; and you could store wine there. But I think it ought rather to be made into a coal cellar. One could easily store thirty or forty thousand kilogrammes there if there were a real reason for buying coal en gros, in great quantity. You will see. I took the liberty of opening a letter addressed in your name and stamped with a stamp of Lagesse; and I was right, for it contained simply a receipt for two hundred francs that he no doubt owed you. Giacomelli has lost his wife. I am sending him your card and mine, with a word of sympathy. The day was quite cold and foggy. This is decidedly villainous weather. As soon as you are back, we will really move into our winter quarters. I forgot to say regarding the new cellar that the work on everything having to do with the other rooms is going to begin shortly. The architect of the house had a long meeting with the architect of no. 23, for it seems that there are very complicated questions about the wall in between. Happily, we didn t take it inside. But I will be content when our rooms upstairs are also finished. And that s all for today. Our journal is about to end, for your return is near. For me, your letters were a great pleasure every morning and I am happy to think that mine followed you everywhere, reminding you that the house was waiting for you and that you have an old and good friend there who loves you and in spite of everything dreams of your happiness as if it were his own. Monsieur Din just made me rage. He had stayed under... and I looked for him everywhere. I told him you were about to return, and I think he understood...". The following day, on the 20th, Zola writes: "This morning I received your letter in which you fixed your return for Monday. If thus you keep this date and if you don t stay in Rome until the Consistory, this letter is the last you will be able to receive in Rome, as it will arrive Friday morning and you should be leaving on Friday evening, according to the data you gave me. Thus, I am embarrassed as to an address for the letter I ll write you this evening and which will depart tomorrow. I m going to await your letter of tomorrow, and I ll make my decision if you have stuck to yours. In this case, this letter would be the last which I would send you to Rome, and I would address the one this evening to Turin, general delivery. By the way, I think Monday is an excellent date for your return". Sydney: Hayes Brothers, 1895. Quarto, with numerous maps (some folding), plates and text illustrations, original cloth; some spotting of the top edge of the text block, yet an unusually attractive copy of a book typically found in average condition. The hermit of Berowra. One of the best known and eccentric accounts of early European discovery, using the Dieppe maps as proof of early Portuguese mapping of all but the south coast of Australia in the early sixteenth century.George Collingridge (1847-1931) was a remarkable amateur historian and artist who emigrated to Australia in 1879 following a turbulent life of travel and adventure, including service in the papal forces against Garibaldi. A skilled wood engraver who worked for the Illustrated Sydney News, he later settled in Hornsby to pursue his feverish interest in Australian maritime history.Through this exhaustively researched and still impressive work he sought to prove that Portuguese mariners had discovered and mapped Australia in the sixteenth-century long before the Dutch; it was published in 1895, the same year that he settled in Hornsby and built a sandstone cottage called, of course, "Jave-la-Grande". Despite the rejection of his thesis by several of his contemporaries, Collingridge's fluency in Spanish and Portuguese, and the astonishing array of materials he examined, means that The Discovery of Australia remains an important attempt to prove a radical theory and 'it is now increasingly recognized that the cartographical core of his argument deserves more serious consideration than it received from orthodox Australian historians' (ADB). He was made knight commander of the Portuguese Order of St. James of the Sword in 1908. London: Osgood, McIlvaine, 1895. Du Maurier, George. TRILBY. A Novel. London: Osgood, McIlvaine, 1895. 141 illustrations by the author including frontispiece. FIRST ENGLISH ONE-VOLUME EDITION AND FIRST ILLUSTRATED EDITION preceded only by the 1894 non-illustrated three-volume first edition which is rarely seen today. A FINE copy (gilt blazing bright) in a VERY GOOD example of the extremely uncommon ORIGINAL PUBLISHER'S PRINTED DUSTJACKET which is a little chipped along the bottom edge, and at two small points near the top. But there is no loss to any of the lettering or the design. Two very small pieces of archival tape can be found on the verso of the DJ. Du Maurier (1834-1896) was one of the most successful illustrators of the last half of the Victorian era, the much acclaimed illustrator for "Punch" and other popular publications. Toward the end of his life, at the urging of Henry James, he produced three novels, the most extraordinarily successful of which was TRILBY which begat hysterical Trilby-mania (the Trilby hat changed men's fashion, it became the name of a town in Florida) and introduced the character of SVENGALI, the evil mesmerist who hypnotizes the lovely Trilby into becoming a world renown diva through his dark hypnotic talents (thus serving as the inspiration for Gaston Leroux's PHANTOM OF THE OPERA). This is the novel for which Du Maurier will forever be remembered, a book which made hypnotism just as much a part of our modern culture as Svengali has become part of the English Language as the descriptor of anyone who manipulates another person in a sinister fashion through the force of mesmerizing persuasion. The survival of this dustjacket seems to us to be of equal rarity to the survival of Thomas Hardy's JUDE THE OBSCURE which was also published in a six-shilling single volume by Osgood, McIlvaine in November of this very same year. . First Edition. Fine/Very Good. Nichols, 1895, Hardcover, Book Condition: Good, Dust Jacket Condition: No JacketThe boards are a bit marked, sunned and worn. Both ffeps are missing. Soundly bound. Edition limited to 500 copies. Mild tanning. Quantity Available: 1. Inventory No: sn17. Priv. print. for the author by S. Usher, 1895-01-01. First Edition. Hardcover. Acceptable. Signed. Limited ed. No. 19 of 100 copies. x, 151 pages. Numerous plates, portraits, coat of arms. 25 cm. Book plate of Burham Standish Colburn. Mayflower Society inscription on front pastedown from 1977. Bound in publisher's cloth. Hardcover. Hinges rebacked. William Colburn Standish added, some minor marginalia. Ships daily. New York: Harper and Brothers. Fine in Fine dust jacket. 1895. First Edition. Cloth. Red cloth blocked in gilt and black on the upper board and spine, in the publisher's printed paper dust-wrapper; pp. xii, 397, illustrated throughout with plates and in text. The book is bright and sharp, with light foxing to the text block edges, offsetting from the jacket to the endpapers, else fine; jacket has chipping to the spine ends and corners and along the top edge of the rear panel, one chip at the bottom of the rear panel, but still quite presentable. .